In May, 1934, a pair of small-time bank robbers—Clyde Barrow and Bonnie Parker—were ambushed by Texas Rangers and Louisiana state troopers on a road outside Gibsland, Louisiana. In a 16-second hail of 187 automatic rifle and shotgun rounds fired at their Ford V8 sedan, Clyde, 25, and Bonnie, 23, were both hit dozens of times and died at the scene. Though not particularly effective as robbers, Bonnie and Clyde had famously been on the run for two years, dodging law enforcement officials and becoming folk heroes to a populace discouraged by the Great Depression and in desperate need of distraction. The allure of these two poor kids from the slums of west Dallas continues unabated, and the small Louisiana towns central to their deaths have capitalized on their appeal. 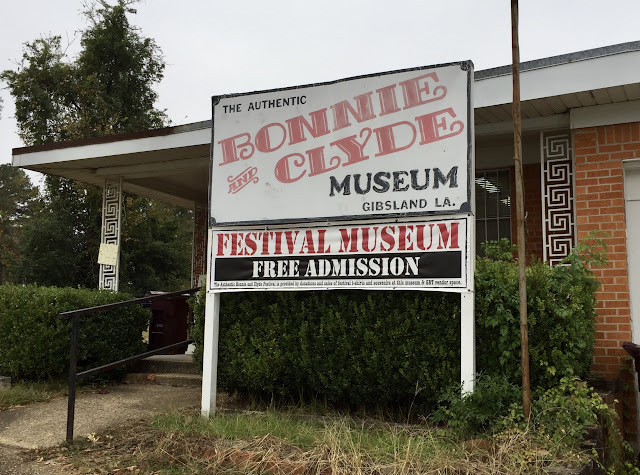 With little else of interest along our route on US-80 through Louisiana, we decided to check out a few Bonnie and Clyde sights today. Our first stop was in Arcadia (pop. 2,912), county seat of Bienville Parish where the pair met their demise. The bullet-riddled corpses of Bonnie Parker and Clyde Barrow were still in their death car when it was towed eight miles from the ambush site south of Gibsland to the town of Arcadia, where the parish coroner operated out of Conger's Furniture Store and Funeral Parlor. While he labored to autopsy and embalm the couple, a crowd of relic-seekers ripped the car apart for souvenirs. According to some reports, mobs of people broke the store's plate glass windows, ruining the furniture inventory in an attempt to get near the legendary outlaws and obtain a souvenir lock of hair or shred of blood-stained clothing. 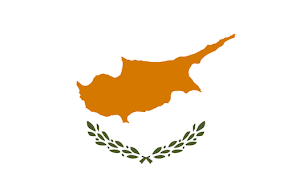 Unlike neighboring Gibsland (pop. 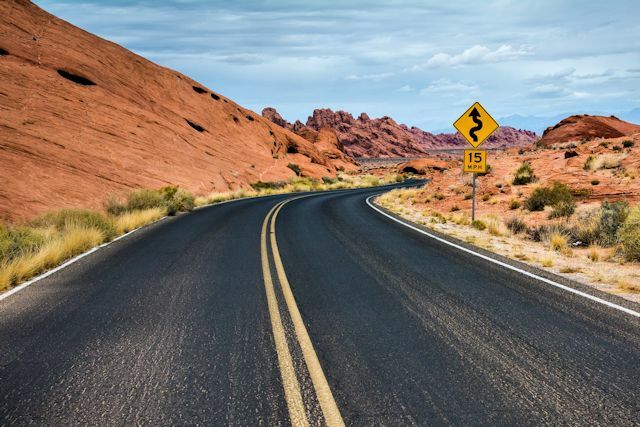 958), the closest town to the ambush spot, the town of Arcadia for many years wanted nothing to do with its role in the story of Bonnie and Clyde. The mortuary/furniture store eventually became a pizzeria and then was bulldozed into a vacant lot. In 2010, the town gave in to its destiny and turned the vacant lot into the Sheriff Henderson Jordan Park, named for a local lawman who was part of the posse that ambushed the car. A bronze plaque praises him and other members of the posse. 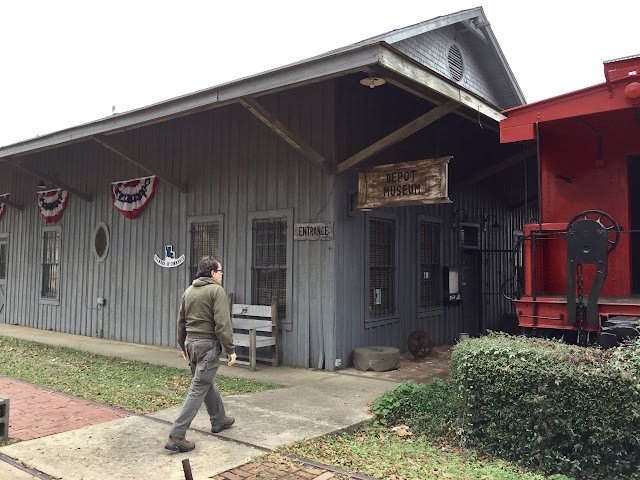 This proximity was all the prompting we needed to plant a letterbox across the street near the depot museum that now includes a small B & C exhibit. THE AMBUSH MUSEUM WAS OWNED UNTIL RECENTLY BY THE SON OF A MEMBER OF THE POSSE. 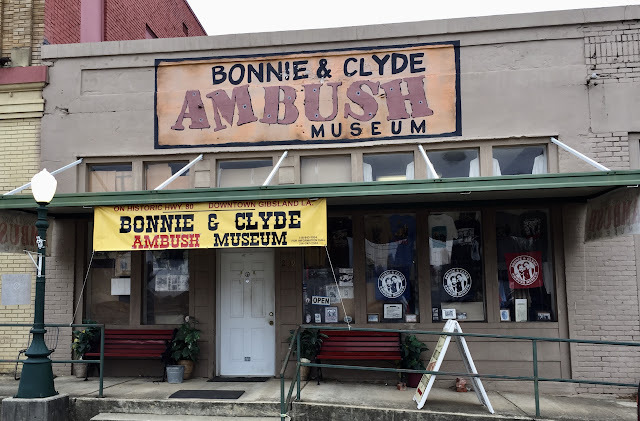 Having already visited the ambush site in 2008 in search of a couple of letterboxes there, we focused our time today on the two Bonnie and Clyde museums in Gibsland. We started at the Bonnie and Clyde Ambush Museum, a for-profit enterprise housed in a low-key storefront that was once home to Ma Canfield's Cafe, where the fated duo dined for the last time. LOTS OF ITEMS ON EXHIBIT; HOW MANY ARE AUTHENTIC IS DEBATABLE. 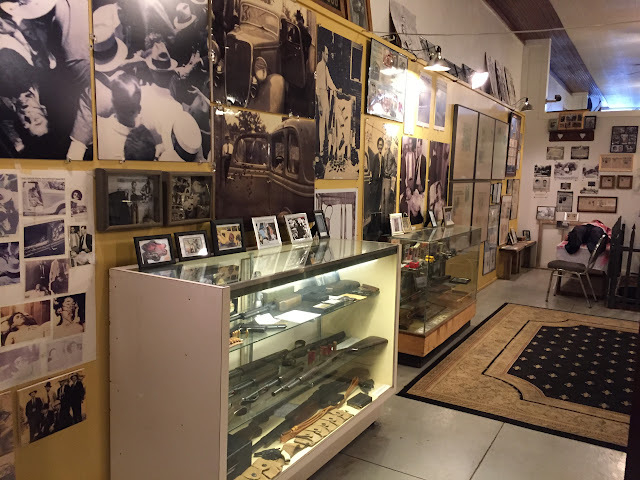 The museum has a large collection of Bonnie and Clyde artifacts, notwithstanding the fact that most appear to have a questionable provenance. 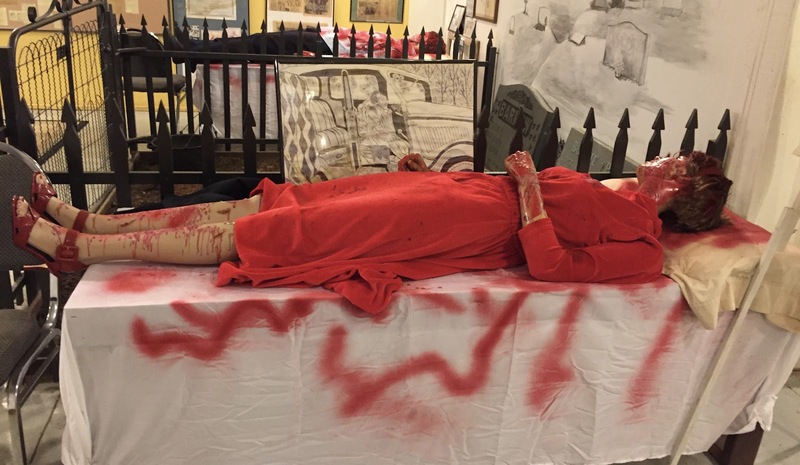 The "curators"—and we use that term very loosely—are not afraid to incorporate a bit of graphic violence in their exhibits, though some are so crudely executed they induce more humor than horror. LOTS OF RED PAINT WENT INTO THE MAKING OF THIS DISPLAY. 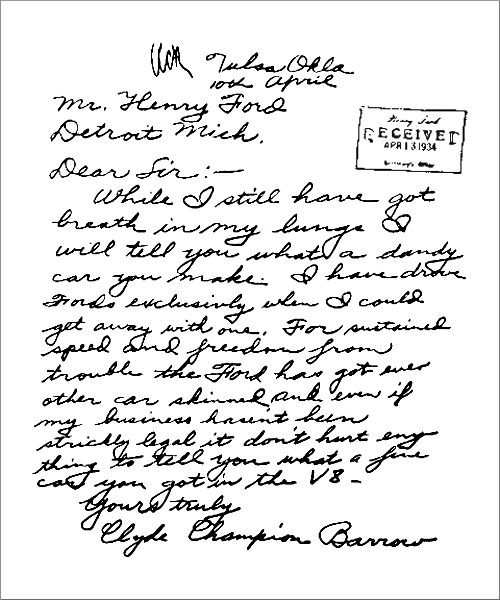 One of the more interesting items on exhibit was a letter purported to have been written by Clyde Barrow to Henry Ford just a month before the ambush. The original is currently on display at the Ford Museum in Dearborn, Michigan, though its authenticity has often been questioned. Two doors over in a city owned building, we visited the Authentic Bonnie and Clyde Museum, staffed by a volunteer and offering free admission. 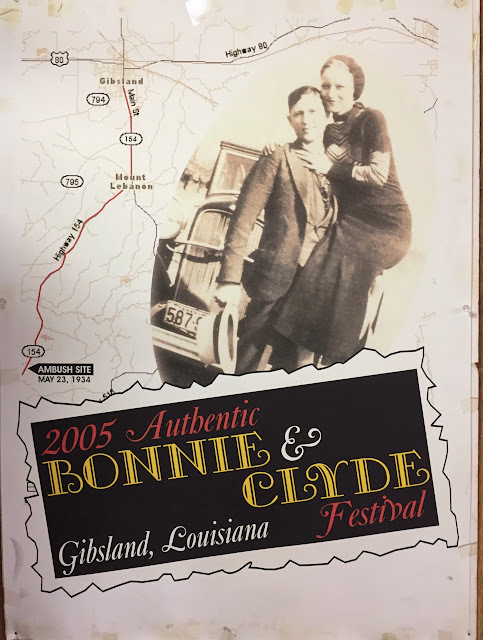 Their exhibits were limited to newspaper articles, photos, and posters from the annual Bonnie and Clyde Festival, which that museum has sponsored since 1993. 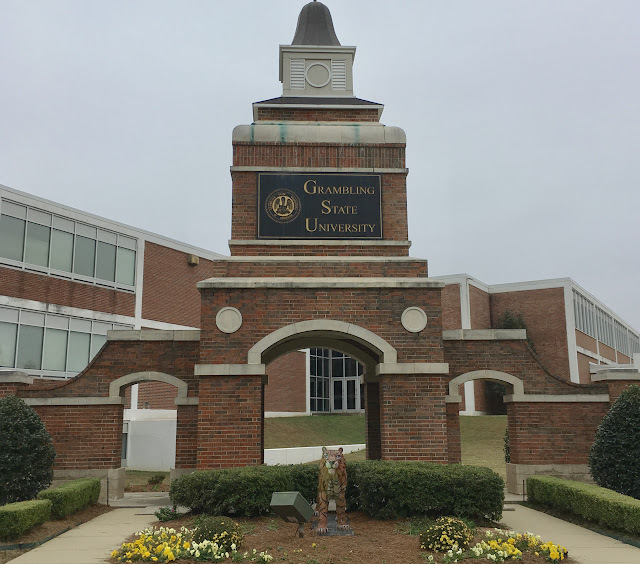 A recent newsletter invited would-be attendees to "a festival loaded with fun." Among the events promised were: "five factual reenactments of mock bank robberies and shoot-outs in the streets!" and "re-creating the ambush at the site!" Participants were encouraged to "come early Saturday morning and enjoy the pancake breakfast at the Lion's Club." Of course, no Bonnie and Clyde Festival would be complete without a B & C look-alike contest with separate categories for adults and children. NOT MUCH HERE, BUT IT'S FREE. After getting our fill of Bonnie and Clyde, we continued west on US-80 to Bossier City, just across the Red River from Shreveport, our destination for the day and our TIME OUT spot for Sunday. If anything, our second experience with this new policy served to confirm our instincts that taking a day off each week of travel is a sound policy. On Monday, we will most definitely make our way to Texas, hoping to take in some sights around Dallas. 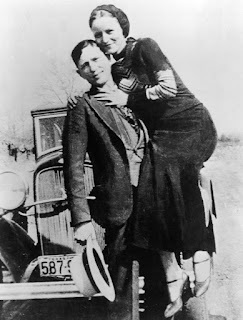 Maybe we'll even visit the grave sites of Bonnie and Clyde. 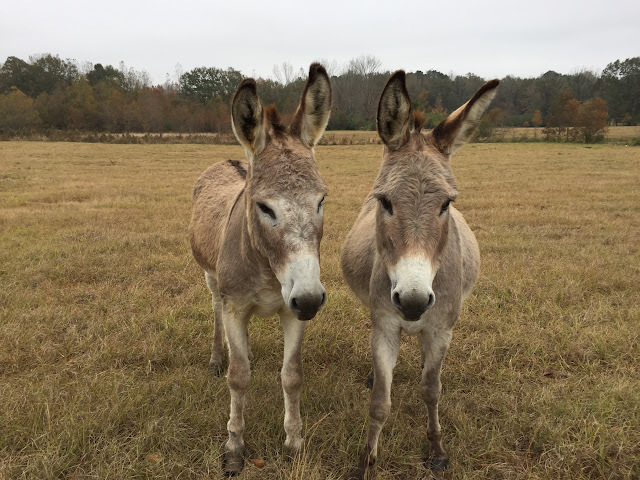 Loved: Meeting the other Bonnie and Clyde, a couple of donkeys we befriended along the way. Learned: That BonQuiQui is alive and well and training employees at the McDonald's in Ruston, LA. Just to see how far it would go, we stood in line for 7 minutes being ignored by multiple idle employees on duty before one decided to take our order. With All Due Respect: In Minden, LA, we saw an historic ash tree which formerly grew next to the old city hall. 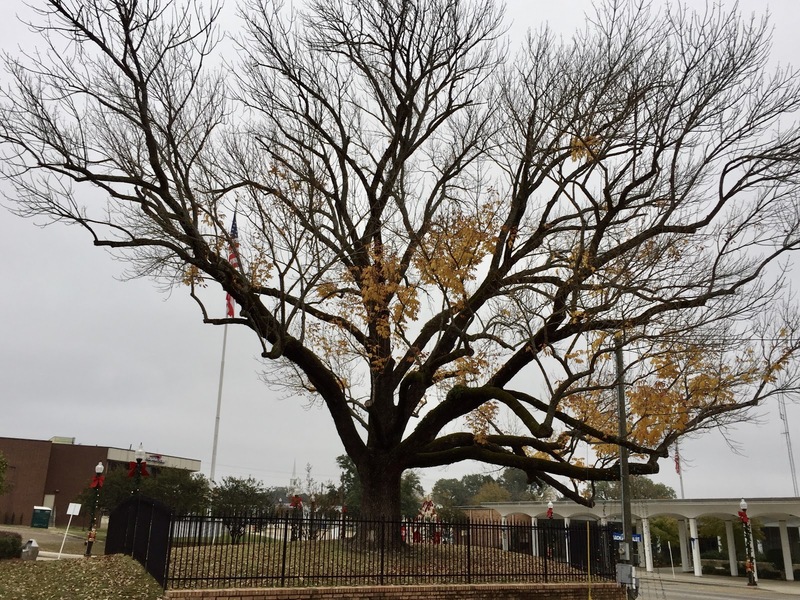 Planted in 1905 by a sheriff's deputy seeking relief from the afternoon sun streaming into his office window, the tree was saved by popular demand in 1971 when the old city hall was demolished. Recently a fence was installed to protect this venerable elder. Before leaving Louisiana, we had to release one of our ducks. On Sunday, Quack the Knife left us on the Red River between Shreveport and Bossier City. From there, we hope he'll make it to the Mississippi River and thence to the Gulf of Mexico. 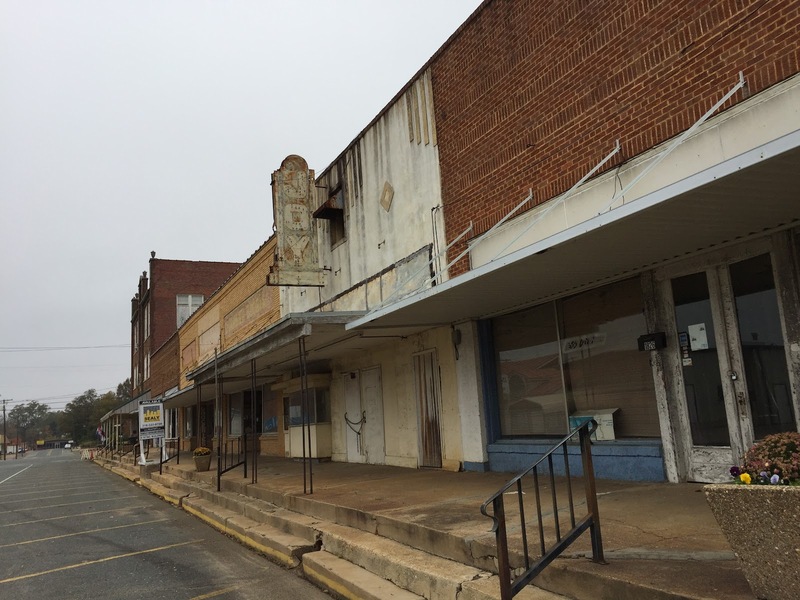 ONE OF MANY VACANT COMMERCIAL BLOCKS IN SMALL TOWNS IN THE SOUTH. 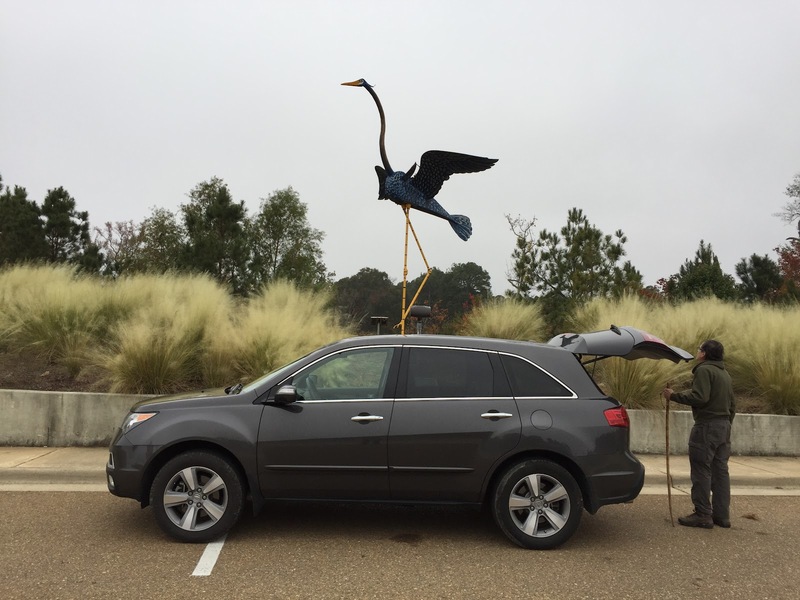 BLUE HERON SCULPTURE APPEARS TO SIT ATOP OUR CAR IN WEST MONROE, LA. MAIN ENTRANCE TO GRAMBLING STATE UNIVERSITY, GRAMBLING, LA. CLYDE AND BONNIE, THE DONKEYS WE MET NEAR A WEYERHAEUSER PLANT IN ARCADIA. 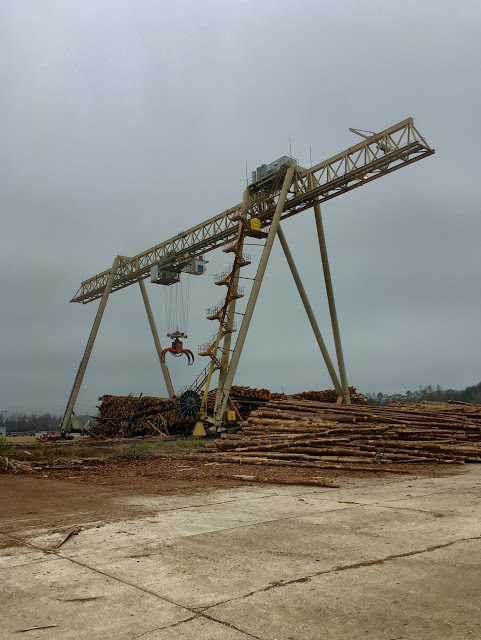 HUGE CRANE AT THE WEYERHAEUSER PLANT.